The week we spent in Twisp with our friends Bill and Debi flew by. Although we have since moved on to a different area of Washington I still wanted to blog about two really interesting places we visited. The first was almost right across the Methow River from our campground. This is home to the North Cascades Smokejumpers Base. The base is the home of a group of very brave men and women who jump from planes to fight forest fires. Rather than go into a lengthy history of this group, just click on the link above. Just briefly, the idea of jumping from a plane to combat forest fires began in 1939 when a small group made 58 experimental jumps into the nearby forests to determine whether or not this was even feasible. No injuries were sustained and the first actual fire jump was eventually made on August 10, 1940. Today, there are approximately 400 smokejumpers throughout the western US and Alaska. The teams fall under the jurisdiction of the USFS and BLM agencies. When we drove over to their base, we walked into the office and requested if a tour might be possible. The guys in the office were very accommodating and radioed for the "rookie" to respond and lead our tour. Our guide took us into the parachute loft where a few team members were packing chutes. Our guide did an excellent job of detailing the history of the unit, along with showing us the equipment used by smokejumpers. In front of the main office is this plaque commemorating the early beginnings of the smokejumpers. We concluded our excellent tour with our guide taking a group picture of the four of us in front of their plane. If you are ever in this area I would recommend spending about an hour and take a tour of the Smokejumpers Base. It's free and no reservations are required. Our last adventure before leaving the Twisp area involved an all-day trip via ferry on Lake Chelan to the small village of Stehekin. Stehekin is a very small village located near the north end of Lake Chelan, which is approximately 50 miles in length. This little place is located in the Lake Chelan National Recreation Area. The village is so remote that there are no roads leading to it. 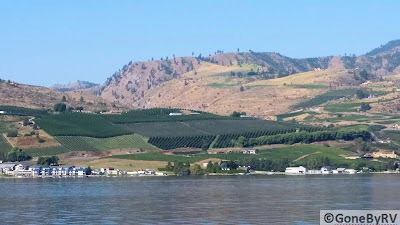 The only way in is via ferry (which we took from the city of Chelan), private boat, seaplane, or by hiking in. During this time of year visitors wishing to travel via ferry can either ride the Lady of the Lake II or the Lady Express. 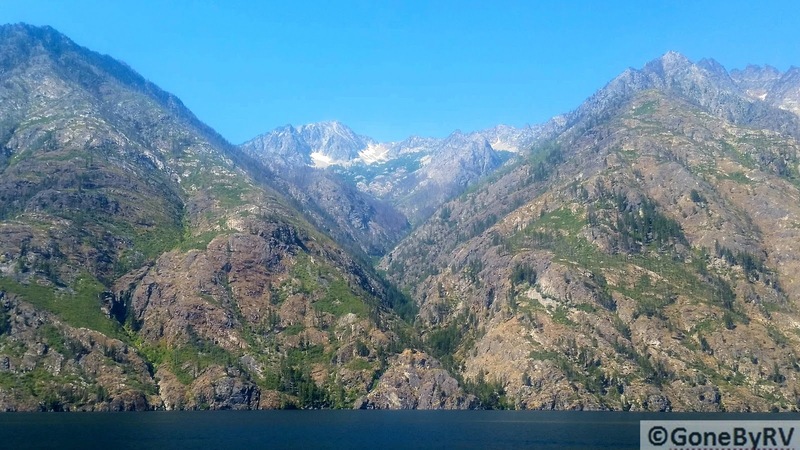 The difference between the two is the amount of time for the layover in Stehekin. We boarded in Chelan at 8:30 AM for the 4-hour ride to Stehekin. The ferry ride is very relaxing and passes by a variety of landscapes along the route. 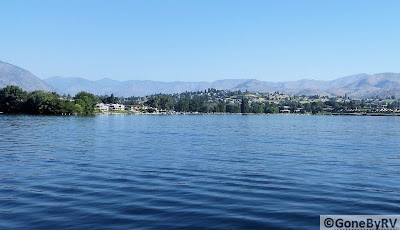 The lower part of the lake consists of many residences and businesses near Chelan. As you travel northward evidence of many vineyards come into view. 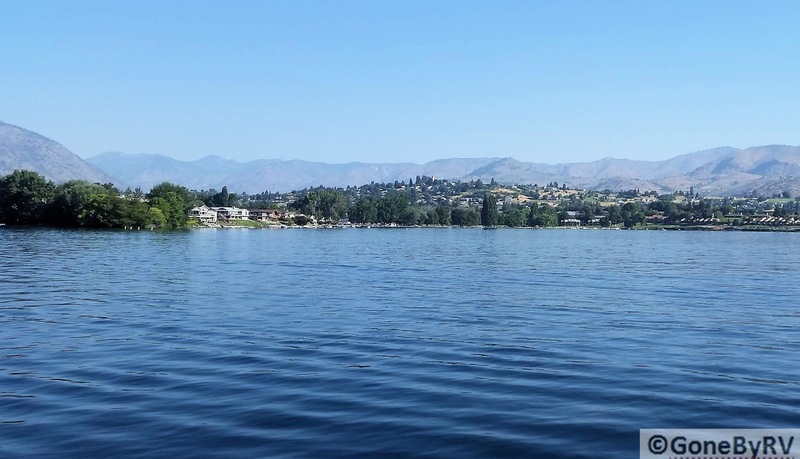 At one point Lake Chelan reaches a depth of 1485 feet. The area was formed by glacial movement long ago. About 1/3 into our journey and all roads along the lake cease. It's still possible to view a few homes dotting the hillsides ever so often, and you wonder how all of the materials were brought in for their construction. The more remote the area, the prettier the scenery became. There are vehicles in Stehekin to move tourists about and to facilitate activities of the NPS, but they all must be brought in by ferries which only handle such equipment. 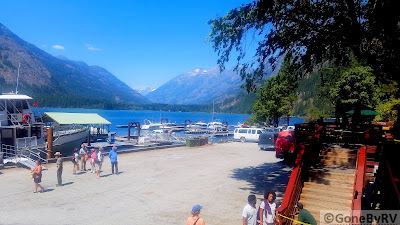 We arrived at the dock at Stehekin at 12:30 PM and only had 90 minutes before departure. Just enough time to eat a quick lunch we had brought along, and to visit the NPS Visitor's Center in town. There are places to stay for overnight lodging and if I return again I believe that we would like to spend a couple of days visiting the remote area. From what I understand, reservations need to be made well in advance of an intended stay. The whole area was beautiful and the feeling of being "away from civilization" was very alluring. I want to express our appreciation to Bill and Debi again for taking time to bring their RV to the campground where we were staying for the week. They were excellent "tour guides" and directed us to many places which we probably would not have found on our own. Thanks again guys! The next blog post will be about our activities in the North Cascades Mountains. As always, thanks for stopping by to take a look! Looks like you had a great time and it's always fun to run into old friends along the way. Dave we really didn't "run into" them, but I know what you mean. We'll meet up with them again in a couple of weeks before leaving WA. 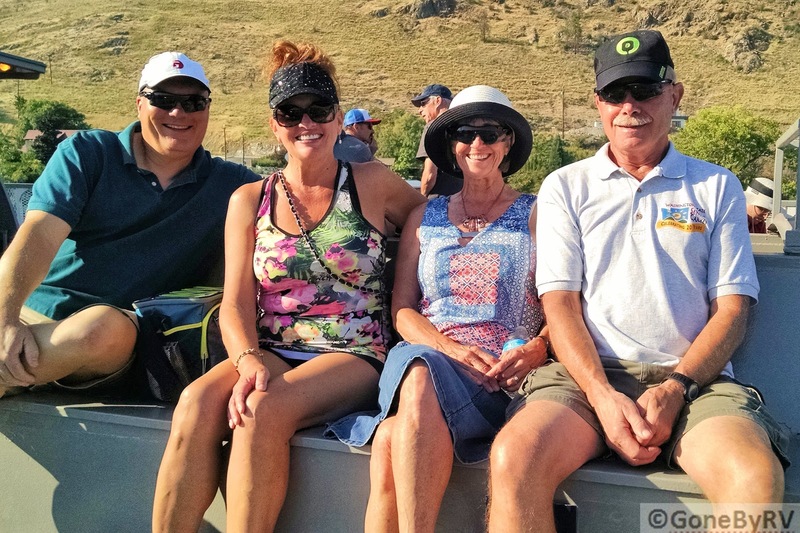 Thanks for the tour of Lake Chelan. About 40 years ago, I read an article about Stehekin (Readers Digest I think), mostly in wintertime, and I've wanted to go there ever since. My one opportunity was a few years ago during an RV trip but the pups made it nearly impossible to do, so we didn't go. Glad you got to see it. You should make a return to that area, if possible. We really enjoyed the area. Bet those smokejumpers are busy now, CA is burning like mad. Concrete, Dams, and a "Dam Good Chicken Dinner"